Amongst run-of-the-mill offices in the Division of Psychology at the University of Stirling nestles a suite of rooms entirely dedicated to accommodating a fully operational (and occasionally quite noisy!) kindergarten facility. In the Division of Psychology at the University of Stirling, we regard our onsite kindergarten as one of our greatest assets. However, when we say this to others, we are used to encountering reactions that range from incredulity or uneasiness to plain bewilderment. Some assume that we maintain the kindergarten to provide a childcare facility for staff. Others, who understand that the primary function of the kindergarten is to facilitate our research and research-led teaching, seem to think that the childcare experience itself might be somehow compromised by this goal. Readers may be relieved to hear that we don’t keep the children under strictly controlled conditions, austere and isolated, like bacteria in a petri dish. But we decided that it was time that we put the record straight more broadly. The kindergarten at Stirling University is unique in the UK, because it is run by the Psychology Division. Similar kindergartens have been available in other institutes in the past, for example at the Universities of Sheffield and Edinburgh, but this seems to be becoming increasingly rare. We are aware of some similar facilities that are currently active and heavily used by psychology researchers but, to the best of our knowledge, not run by a psychology department (for example in Bangor and Lancaster). In this article we want to highlight how important our onsite kindergarten is for the Division of Psychology and what we think others might be able to learn from this model. We also wanted to pull together all the reasons why we think our psychology-run kindergarten provides a really outstanding experience – for students, for researchers, for parents, and also (in fact most of all) for the children. Undergraduate students may begin a university course in psychology without knowing which specific specialism they would like to pursue. One of our roles is to guide them in finding their own individual interests and motivation, and to provide an environment that supports active, engaged learning (see research from David Kember’s group). This can be a real challenge when faced with 200 undergraduate students! 1. Seek ethical permission for the study. 2. Provide a parent information sheet to allow parents to opt their child out of the study. 3. Read and follow the kindergarten’s guidelines and safeguarding procedures. 4. Read and follow the British Psychological Society’s code of human research ethics. Students then sign an agreement indicating that they have satisfied the above criteria, which will gain them a research passport, giving them permission to run the study with children. When working with children in mini-projects, students can actively construct knowledge and make connections between theoretical approaches and their own experiences. Students often say that having carried out a mini-project with the children changes how they later read and interpret scientific developmental papers and how they process the lecture content. As one student framed it, mini-projects ‘provided excellent grounds for learning’. Students additionally gain insights into strict ethical procedures and they learn whether they actually like working with children. The mini-projects also establish relevance, as students get to test theories they have heard about in lectures. In sum, most of the students regard this project-based learning as a very valuable experience, which is usually fun for both students and children. The kindergarten is not only a stimulating learning environment for undergraduate students, it also facilitates Dr Catherine Grainger in offering a range of meaningful experiences for students of the MSc in Child Development. Many of our postgraduate students are attracted to this course because of the kindergarten, which provides them with the chance to gain valuable research skills in developmental psychology. Each year, several child development students complete placements in the kindergarten, in which they gain hands-on experience interacting with pre-school children, and collect data for their own research projects. The kindergarten is set up with several video-monitoring testing rooms, and a one-way mirror observation room, which allows our students to use a variety of approaches ranging from observational studies to free-play paradigms to experimental studies. For research projects dependent on access to pre-school participants, the kindergarten represents an invaluable resource. Currently, the kindergarten is stimulating a wide variety of state-of-the-art research, such as understanding key developmental challenges (e.g. cognitive development, language acquisition, drawing inferences), social learning and cultural evolution as well as paediatric physical health. In many cases, involving the children from the kindergarten does not substitute for offsite recruitment, but instead facilitates work carried out in association with external organisations. The kindergarten provides an ideal testing ground for novel tasks and data collection protocols, ensuring that researchers can arrive at nurseries and other recruitment sites with robust and well-rehearsed methods. This minimises the demands on any staff responsible for providing access, and maximises the time-efficiency of data collection. In developmental psychology research, maintaining goodwill with partner organisations is absolutely critical, and since participants’ reactions to experimental procedures are notoriously hard to predict, having the onsite kindergarten to pilot new protocols is a huge benefit! 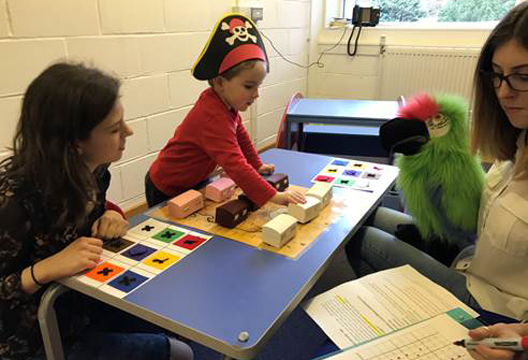 Having access to the kindergarten has therefore been pivotal to the success of a wide variety of research projects within Stirling’s Division of Psychology. This includes a large EU-funded project led by Professor Christine Caldwell (RATCHETCOG). Although the project also encompasses studies of adult participants and nonhuman primates, the developmental studies are key to the project’s overarching goal of understanding the cognitive mechanisms implicated in human cultural evolution. As an example, one of the recent RATCHETCOG studies, led by Dr Mark Atkinson and Dr Elizabeth Renner, investigates the relative benefits of socially and individually acquired information, and how these vary at different ages. Children take part in a simple task (a ‘find the monkey’ game) presented on a computer tablet. Testing various versions of this task in the kindergarten ensured that the final version of the game was clear and engaging enough to hold the interest of two- to five-year-old children. A child interviewed after she had participated in the game clearly expressed her enthusiasm: ‘When the monkey sprang out and fall on my head – that made me laugh!’ The opportunity for extensive pilot testing in the kindergarten not only facilitated a short timescale from initial experimental design to completed data collection, but also ensured our confidence in the robustness of our task design before contacting collaborators. Over 350 children have participated in this study at Glasgow Science Centre and, as part of a collaboration with researchers at Peking University, kindergartens in Beijing. Illustrating the diversity of the research taking place in the kindergarten, cognitive neuroscientists Dr Yee Lee Shing and Dr Jan Kuipers conduct studies using eye-tracking and wireless EEG. Dr Yee Lee Shing is generally interested in memory development. Using eye-trackers to measure gaze fixation, she is studying how our ability to infer a relationship between events that were not experienced together develops across young and middle childhood. The onsite kindergarten is particularly helpful for investigating neurocognitive development during the transitional period between pre-school and primary school. Dr Kuipers is developing the use of wireless EEG to replace the traditional wired EEG. Testing of this system, and how its output compares to traditional EEG, is still ongoing, but has been facilitated tremendously by the onsite kindergarten. The children of the kindergarten took part in a pilot study testing the wireless EEG and were fascinated to see their own brainwaves. Dr Kuipers is planning to study language development in children with this system. Having onsite access to a sample of under-five-year-old children has also enabled our staff to forge additional research links with other institutions, and carry out joint projects with institutions that do not have such readily available access to young participants. An ongoing project with researchers from the Psychology Department at the University of Edinburgh, for example, is both replicating and extending some of their recent work on the tendency for children to imitate the language and non-linguistic actions of other individuals. Beyond supporting ongoing projects and collaborations, the kindergarten is a unique feature that attracts new staff with wide interests to the university, which is key to retaining a vibrant research community. Recently, the Psychology Division hired two new academic staff members interested in developmental research but with a diverse background and focus. Dr Catherine Grainger is interested in understanding the nature of autism spectrum disorder, while Dr Line Caes is trying to understand pain experiences in children. Both indicated that the kindergarten played a crucial role in their considering and accepting a permanent academic position at the University of Stirling. Across various studies, we have informally observed that participating in research is an interesting and positive experience for the children. As scientists, we would like to know more about this, so in the near future our team plans to systematically examine the impacts of participating in research on children. For example, we would be interested in comparing self-reports from children when they have and have not taken part in research, to compare how study participation may influence their levels of engagement and enjoyment that day in the kindergarten. Above all, the kindergarten is focused on being a stimulating and nurturing environment for the children (e.g. building confidence, helping develop a positive sense of self, exploring early literacy and mathematical concepts). The needs of the children (and their parents) always come first, with teaching and research activities being fitted around the kindergarten’s schedule and activities rather than the other way around! While there is a small fee to enrol their child in the playgroup (£7 per 3-hour sessions), which is lower than most other childcare services, this lower fee is not linked to our research practice. Enrolment in the playgroup is not contingent upon consent to participate in research. Parents can opt from the start to not let their child participate in research and can withdraw consent at any given time, without placing their child at a disadvantage with regard to getting, or keeping, a place. Additionally, even if parents consented for their child to participate in research, children themselves are always given the chance to say no before the start of any research activity. Hence, this reassures us that parents make an active choice to enrol their child in our playgroup by seeing the benefits. Of course, it is important to emphasise that running a kindergarten is not without its challenges. Provision of a childcare service is a huge responsibility and managing the risks can generate a lot of additional work. However, feedback from parents and children is sought on a regular basis to ensure they remain content with how the kindergarten is run. And like any other nursery, our kindergarten is subject to standards and regulations, and is inspected regularly by the Care Inspectorate. Despite this, we believe the benefits vastly outweigh the challenges as we use our ongoing research to support parents and children in their development. For example, we use our one-way mirror to have parents observe their child on their first days in kindergarten. This allows children to get used to our facilities without disturbance by their parents, but at the same time lets parents closely supervise their child and intervene if they want to. As part of our impact strategy, we also provide parents with an overview of the results of our research, which helps them stay up to date on new discoveries in the area of child development. At our annual Open Day in April, we present our most recent findings to current as well as potential future parents and answer questions they may have. We create a booklet at the end of term that summarises, in an attractive and comprehensible way, what we have learned from each study in which their children participated. And ‘research bites’ are developed at the end of the studies: these short five-minute video interviews with the main researcher provide an overview of the aims and results of the study as well as the relevance of the findings. In conclusion, we are convinced that our kindergarten delivers a variety of tangible benefits for families, students and staff. Its location at the very heart of our Psychology Division even brings delightful indirect benefits into the bargain. (Does your department get an annual visit from Santa? Ours does!) We hope that by sharing our experience of running a kindergarten we might inspire and encourage others to consider setting up similar facilities at their own institutions. Please get in touch with us if you would like to know more. - Thanks to Line Caes, Catherine Grainger, Jan Kuipers, Mark Atkinson, Yee Lee Shing, Eva Rafetseder, Christine Caldwell, and Elizabeth Renner for contributing to this article.